Giraldo, M. [et al.]. 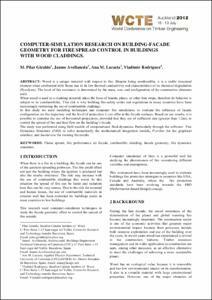 Computer-simulation research on building-facade geometry for fire spread control in buildings with wood claddings. A: World Conference on Timber Engineering. "Proccedings of the World Conference on Timber Engineering 2012". Auckland: 2012, p. 1-8.